For the last few days I’ve been playing with breakout boards purchased from Taobao. So far it’s been a nightmare. GY-271 is advertised as a Honeywell HMC5883L 3 axis digital compass. A Bus Pirate address search turned up 0x1A and 0x1B, instead of the HMC5883L’s 0x3C and 0x3D. The chip is actually a “Q”MC5883L, a Chinese-made digital compass with similar features that is not register compatible. The datasheet for the QMC5883L shows the chip markings as “DA5833”. 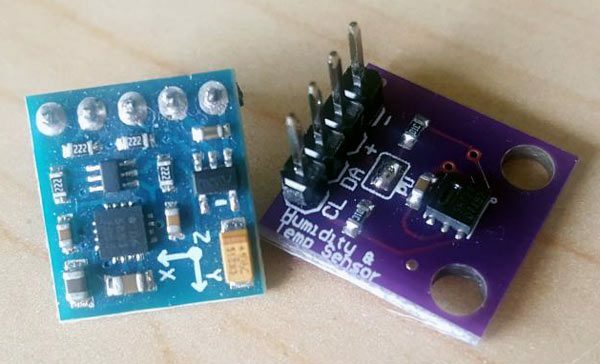 These markings are visible in nearly every Taobao listing claiming to be a HMC5883L breakout boards. Honeywell’s datasheet doesn’t include chip markings, shame on them. GY-273 is another HMC5883L breakout board all over Taobao. About half of these are clearly the “Q” type chip. The other half show the Honeywell chip, at least in the photo. After talking with a quasi-trusted vendor I ordered what are supposed to be actual HMC5883L breakouts. GY-213 is a breakout board sold with a variety of temperature and humidity sensors, including SI701, SHT21, etc. The same color/size/pinout/layout PCB is available from tons of Taobao shops. I ordered a SHT21 version from Youxin, a trusted supplier. The chip appears to be genuine, not the Chinese-made HTU21D, but it seems to be defective in at least two ways. Reading out the configuration register shows 0x3A=00111010, but the power up default should be 000xxx01. At power up the on-chip heater is enabled, which is used for testing and diagnosis. “OTP Reload” is enabled, which is specifically “not recommended for use” by the datasheet. After setting the correct configuration it was time for further disappointment. Humidity measurement is always around 0xF66A. 114.3% humidity seems unrealistic, even for Shenzhen in the spring. This entry was posted on Tuesday, April 17th, 2018 at 8:34 am	and is filed under Shenzhen. You can follow any responses to this entry through the RSS 2.0 feed. You can skip to the end and leave a response. Pinging is currently not allowed. Hmm, that could actually explain why the three sensor IMU breakout I have bought a few years ago had all sorts of issues – I have ascribed it to simply being defective because the compass has never worked properly, didn’t think about it having a fake/clone and incompatible chip on it. Do’h. From the datasheet extract you are showing, the power up status should be 00xxx010, not 000xxx01. Shouldn’t the default be 00xxx010? Note that bit 0 appears out of order in the documentation. In that case I think the initial value is as-expected.